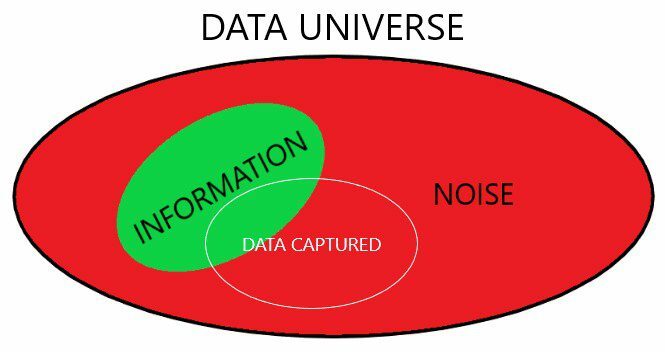 A data universe is formed by information and noise: Information is data that can be transformed into knowledge; noise is data from which no knowledge can be extracted (of course, noise data can also be treated and lead to “findings” which are false knowledge and not truly useful). Note that data being noise or information depends on the business challenge under discussion. In other words, the same datum could be noise in one business case and information in another. Now that we have a definition for efficiency, we can introduce a new concept, Smart Data. In IoT, smart Data is often described as data coming from smart sensors. Some others define it as Big Data that has been cleansed, filtered, and prepared for analysis. There is no agreed definition for “Smart Data.” But I would like to define “smart data” as efficient data. The higher the efficiency, the smarter data is. Regardless of the source or cleaning process of the data, the highest efficiency (or “smartness”) of the data is 100%. How can we make data capturing more efficient and only store Smart Data? It is commonly said that data scientists spend 80% of their time cleaning data and only 20% analyzing it. With an efficient data capturing, Smart Data can rewrite the story where data scientists spend just 20% of their time cleaning data and 80% getting insights that truly makes a business impact. Bio: Ramon Serrallonga is the Chief Data Officer of Cadifornia, Academic Assistant at ESADE Business & Law School, and Lecturer at EAE Business School. Economist, Master in Law, and MBA, his career has been developed in the intersection between business and technology.